In 2004, 157.0 million workers had earnings taxable under the Social Security program. About 140.8 million had only wages, 9.6 million had only self-employment income, and 6.6 million had both. Social Security taxable earnings totaled $4.543 trillion, which includes earnings up to the taxable maximum of $87,900. Social Security taxes totaled about $563 billion. In 2004, 160.7 million workers had earnings taxable under the Medicare program. About 143.8 million had only wages, 9.4 million had only self-employment income, and 7.4 million had both. Medicare taxable earnings totaled $5.561 trillion. Medicare taxes totaled about $161 billion. 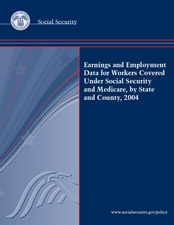 This report presents 2004 earnings and employment data by state and county for persons covered under the Social Security and Medicare programs. Staff of the Earnings and Employment Statistics Team in the Division of Earnings Statistics and Analysis designed, compiled, programmed, validated, and reviewed the data for this publication. Thom Mattson and Dana Sheild in the Office of Systems wrote the computer programs to produce the source data from the Social Security Administration's programmatic data files. Staff of the Division of Information Resources edited the report and prepared the print and electronic versions for publication.